Although there are numerous advantages to using e-cigarettes, as opposed to tobacco, existing smokers often cite three main benefits; health, cost and convenience. 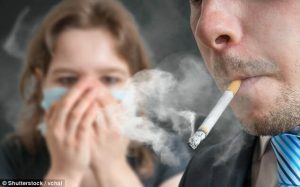 Many ex-smokers report a noticeable improvement in their health following a switch from tobacco. Until recently, some clinicians have been wary of branding vaping ‘risk free’ but the Government has now acknowledged the comparative safeness of vaping. With many smokers eager to quit due to health concerns, vaping can provide an effective substitute. By still allowing smokers to access nicotine, vaping can satisfy cravings but is not believed to pose as many risks as traditional cigarettes or roll-ups. Whilst e-liquid may contain some chemicals, studies have shown that the amount of potentially harmful chemicals in e-liquid is far less than the hazardous substances found in cigarettes. In addition to this, e-cigarettes do not contain tar, which has been linked to smoking-related heart diseases. Due to this, there are significant health benefits associated with quitting combustible tobacco products, which produce harmful products within the smoke, and using non-combustible alternatives instead. It appears, therefore, that vaping can be less harmful to existing smokers, as well as the people around them. The Government has confirmed its intentions to maintain high duty rates on tobacco products. 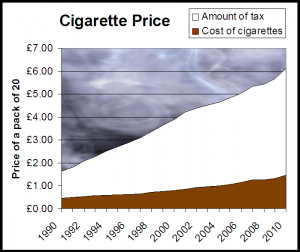 The tax burden on a pack of 20 cigarettes, for example, is now over 80% of the recommended retail price. In addition to creating significant revenue, authorities claim that this high rate of tax encourages existing smokers to quit and discourages young people from starting to smoke. Historically, some forms of tobacco are cheaper than cigarettes and certain cigarette brands are more expensive than others. In order to prevent access to low-cost smoking methods, the Government has introduced measures to reduce discrepancies between brands and prevent the sale of smaller cigarette packets. Currently, the cost of vaping products is far cheaper than the price of traditional cigarettes and tobacco. Whilst e-cigarette users may choose to spend more on a high quality device this is often a one-off purchase which does not require regular replacement. Similarly, coils may need to be replaced more often but they can be purchased fairly cheaply and do not equate to the cost of tobacco. Currently, retail prices for e-liquids start at approximately £4-5 per 10ml bottle. Whilst usage rates will vary between people, many moderate smokers report that a standard bottle of e-liquid lasts in excess of 7 days. As the price of smoking has risen to approx. £7-10 per packet of 20 cigarettes, there is great potential for smokers to save money by switching to e-cigarettes. A daily habit which may have cost smokers in excess of £10 per day could be reduced to less than £3 per day, depending on the user’s smoking style, amount of nicotine, e-liquid and equipment they choose to use. With significant savings to be made, the comparative low cost of vaping may account for the large numbers of people who have switched from tobacco. The tight restrictions on smoking tobacco mean that it is increasingly difficult for smokers to find somewhere they can smoke legally. Whilst people may smoke in their own homes, Smokefree legislations was designed to protect people from the dangers of second-hand smoke, which means that smoking is banned in almost all public spaces. Whilst many organisations have requested that people refrain from vaping in public spaces, Public Health England recommends that e-cigarettes be excluded from Smokefree policies, thus making vaping a more convenient choice for consumers. Although the legislation governing the use of e-cigarettes has yet to catch up with the widespread use of devices, the Government has announced its intentions to support organisations which want to develop vaping friendly policies. Currently, vaping remains a far more convenient option for people. It is also becoming more acceptable due to the fact that e-cigarettes are not included within Smokefree laws. It is, however, up to a venue owner to decide whether they add them into their specific policy or not. The more venue owners understand the benefits of vaping, the more convenient it becomes. With the UK set to leave the EU, there has been talk of limiting the relevant regulations. Whilst the Tobacco Products Directive does apply to e-cigarettes, activists are calling for the Government to review the Tobacco and Related Products Regulations 2016 (which is the UK law of the TPD) following our departure from the European Union. Although the terms of Brexit have yet to be negotiated, it appears that a move to retain a more fit for purpose regulation in the future would allow vaping to continue to provide an alternative to smoking. When HMRC consulted on tax of vape products, the feedback was overwhelmingly to maintain zero additional tax which means consumers will save a significant amount of money by vaping, rather than smoking. This factor alone could persuade smokers to quit in favour of e-cigarettes, particularly if the tax on cigarettes continues to increase. With over 2 million people replacing smoking with vaping by 2016 alone, the increasing popularity of e-cigarettes is undeniable. Whilst cost and convenience has had a significant impact, it is, perhaps, health concerns which have been the biggest factor in persuading smokers to give up cigarettes in favour of vaping. With existing research strongly suggesting that e-cigarettes are less harmful than tobacco and further studies to be undertaken, it’s likely that even more people will move away from traditional cigarettes in favour of the health, convenience and cost benefits offered by e-cigarettes and vaping. Liberty Flights stock a vast range of vaping product to get you started. Improve your life, save money and time and get quick delivery on all orders. I agree this smoking habits has to change. Smoking is simply bad i know this because i was a smoker my self and i know what smoking cause me so i prefer people to switch to vaping.